Katz Knives: The Katz Knife line, since 1991, features Keith Derkatz designs. Katz Knives was founded in 1991 by Keith Derkatz. All Katz knives are designed by Mr. Derkatz, and are made in Japan by high quality manufacturers. 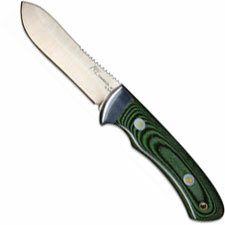 The Katz Knife line includes hunting knives, lock back folding knives, money clip knives and more. The blades of all Katz Knives are made of one of two types of proprietary steel: XT70 stainless steel, that tests out at 54-55 on the Rockwell "C" scale, or XT80 stainless steel, that tests out at 58-59 on the Rockwell "C" scale. With the resilience of these excellent stainless steels, the blades hold and retain an edge to the high standard for which Katz is known. The Katz Bobcat Series Money Clip Knives are available with Jadewood, Cherrywood, or White Micarta handles. A Katz Money Clip Knife converts to a Belt Buckle Knife by sliding it into the Belt Buckle Knife Holder (sold separately). The Kagemusha Series includes a fixed blade knife and a folding knife with the exclusive Ninja-Point blade. Note: We are closing out Katz Knives. These prices are good on existing inventory. No Backorders.